At 10am every third Sunday of the month we have a 40 minute informal service without communion. It’s tailored specifically for young people who take part with scripture readings, prayers and music – as with all our services, anyone is welcome to come and join in. Music is led by our informal group of St Andrews Singers and musicians. Like our Family Worship, the All Age Eucharist – every first Sunday of the month at 10am – is tailored specially for families and young people. It’s shorter and uses more straightforward language compared with our Parish Eucharist. There are often baptisms during this service and the sermon is remarkably short! Music is led by our informal St. Andrew’s Singers group. At 9.50am on the 2nd and 4th Sundays, alongside our Parish Eucharist, Sunday Club takes place in the Clubroom (across from the church on your left as you go through the gates). For children of all ages whose parents/family are attending the Eucharist, it includes stories, discussion, activities and craft, related to the same theme that the adults are following in church. Sunday Club rejoins everyone in church at the beginning of communion, and usually gives a demonstration of what’s been going on! Andy’s@4 is on every second Sunday at 4pm, aimed at pre-school and primary-aged children and their families – but all ages of course are welcome. It is a very informal service that lasts about half an hour. We use the space of our big church imaginatively, singing and making things together. Afterwards, we all enjoy squash, tea or coffee and a biscuit together. Every Tuesday at 1.30pm in church. It’s a mixture of songs, craft, stories and games for children aged 0 to 4 years. We begin in church sitting in a circle and singing a few songs – favourites include “Mister Cow” and “Have You Seen the Pussycat?” – and then a simple story followed by making something (it might be a Mother’s Day card or a decoration!). Then we might have a march – and have a turn at ringing the church bell. Then it’s drink and a biscuit, after which, we get the ride-ons and toys out for the last 10 minutes or so. For the last 9 years, we have sent out two knitted Nativity/Crib sets from St. Andrew’s to travel round the parish for the whole of Advent and visiting a different family each night. Two years ago, the two sets were joined by a third, knitted especially for us by a member of our congregation. It was decided to send this set around households with no one under eighteen. Each set has the knitted figures of Mary, Joseph, Baby Jesus, 2 shepherds, 3 Kings and a donkey & tiny angels etc. 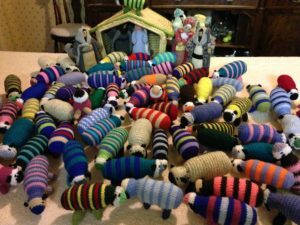 There is also a huge flock of small, colourfully striped, knitted sheep which accompanies the sets. As the cribs leave each home, we ask all the children to choose and keep a sheep as a memento of hosting the set but adult households keep just one sheep! 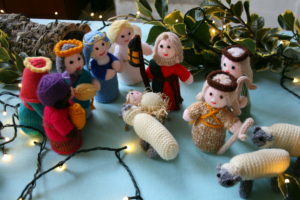 The Cribs, minus most of the stripy sheep, return to church in time for the Crib & Christingle service on Christmas Eve. A journal accompanies each set and always returns to us full of photos, drawings, poems and reflections on the experience together with prayers for the wider St Andrew’s congregation at Christmas and thanks to the knitters and organisers. Over the years there a real sense of community and continuity has built up amongst the hosts.